What if Batman issue 50 had ended differently? What if Bane’s plan failed and the wedding went off without a hitch? Well for those readers out there like me that wanted Batman and Catwoman to tie the knot, you’ll love this issue…until the ending. While the issue was a look into what could have been, Batman is still trapped in his nightmares, and there doesn’t seem to be an end in sight. The issue begins where 50 ends, at the top of Finger Tower (nice nod to Bill Finger). However, unlike issue 50 (one of the most hyped up issues that didn’t follow through) this doesn’t end in brooding and a Batsuit. As Bruce prepares to jump, Selina arrives, and the two longtime lovers finally tie the knot. As the two kiss, someone’s internal dialogue starts. This dialogue is shown not only when Bruce and Selina are kissing, but when they are together on their honeymoon and later on patrol in Gotham. This dialogue discusses the speakers mother running with them. While running, the mother fell and ended up covered in blood. Despite getting back up and continuing to run, she kept falling over and over until she told the speaker to leave her behind. They did leave their mother and ended up at a wedding. At the wedding, he confronted the groom and told him that it was all a dream. He punched the groom, sending him into a rage. When the groom demanded to know if this person knew who he was and why he ruined the wedding, the speaker replied with, “I know who you are…You’re just another dream.” The speaker reveals himself to be John Constantine. John walks out of the shadows of the rooftop Batman and Catwoman are on as Catwoman swings away. “At the end of this…she’s going to die” says Constantine. Batman replies, “I’ll protect her.” “It’s got nothing to do with you. Except the fact that it’s got everything to do with you.” Batman then swings away, not wanting to hear anymore. We jump to Wayne Manor. More specifically, the bathroom where Selina is taking a shower, and Bruce arrives to join her. As he walks towards the shower, he hears, “A few more days. She’ll be bleeding. Held in your arms. You’ll be holding her on some rooftop, crying. No matter what you do, she’s dead. And you know it.” When John says that he’s just there to help Bruce, he claims that he doesn’t need the Hellblazer’s help and joins his wife in the shower. Later, we see Batman defeating Two-Face at a baseball stadium, but once again, Constantine arrives to warn him about Catwoman’s death. Once again, Batman reassures him that Selina is fine and leaves. Then, inside Wayne Manor, Constantine again tries to tell Bruce that Selina is going to die. However, this time, Bruce responds by punching John in the face. Now we can confirm that Bane’s forces have Batman and are using fear toxin to keep him under their control. But was John right? Is there no one that can save Batman? If not, the Dark Knight may be in the worst position we’ve ever seen him in. It seems that all of Bane’s plans, dating back all the way to the wedding, have led to this. However, I’m not sure if this is all Bane has planned. I believe that once they are done breaking Batman mentally, Bane will finally, completely break the Batman in front of the whole world. But this entire arc is supposed to stretch until issue 100 with something supposedly horrible happening to Batman in issue 75, so we still have a long way to go. I will say it was nice to see what would have happened if the Batman and Catwoman wedding had been a success. My hope was that we would get a new kind of Batman: one that finally had a real measure of happiness. 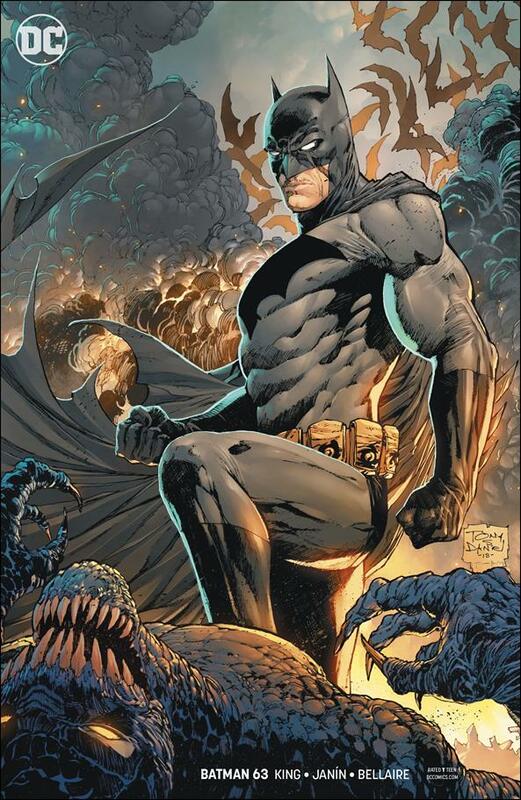 Unfortunately, it seems that DC believes Batman should never be anything other than brooding. I really do hope that by the time issue 100 comes around, we get to see Batman and Catwoman reunite and get back together. If Superman can get married, so should Batman. However, for now, Batman’s biggest problem isn’t his love life. He’s trapped by his greatest enemy and his seemingly rogue father. With no way out of this nightmare trap, what can the World’s Greatest Detective do to save himself? Has Bane finally, fully broken the Bat?